The auto-brightness sensor and preset time scheduler save power whenever possible. The backlighting in specific areas of the screen can be controlled to increase contrast and provide a clearer image with twice the detail. FPR (Film-type Patterned Retarder) technology is embedded with a QWP which enables clear visibility even when the viewer is wearing polarized sunglasses. IPS technology provides better control of the liquid crystals, which in turn allows the screen to be viewed at virtually any angle. 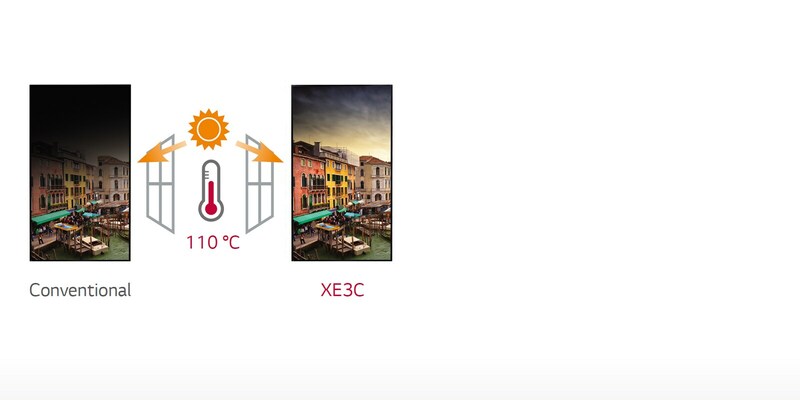 Even under direct sunlight exposure, LG commercial monitors remain free from blackening defects under 110°C and provide superior quality for outdoor usage. Less interference between reflection of external light & back light thanks to anti-reflection coating. The conformal coating enhances circuit board reliability by protecting it from dust, iron shavings, humidity and other harsh conditions. The panel offers superb reliability under high operating temperatures and reduces cooling fan usage. Environmentally sealed structure for waterproofing and protection against brake dust and fumes. Thermal management solution prevents heating from the LCD, Circuit / Power board and Solar loading. Totally self-contained and suitable for outdoor use without air filter. Designed to protect panel from impacts and vandalism for outdoor use. Features OCA* film to protect against heating in direct sunlight. 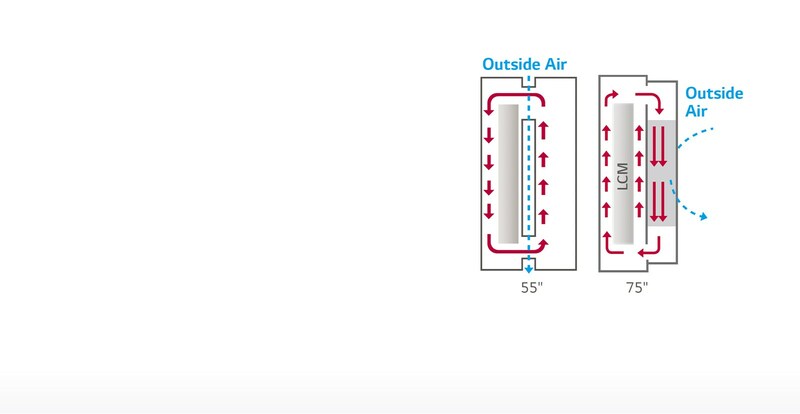 The M+ panel offers excellent energy efficiency and cost savings and decreases power consumption by approx. 31 compared to conventional RGB panels*. The embedded web monitoring allows a variety of parameters to be diagnosed in real time using temperature, pixel, door, ambient light and gyro sensors. It can be easily controlled at all times. Optional stand to allow panel to stand freely and facilitate easy cable management.